Woodwardia areolata.Bobby Hattaway.www.discoverlife.org (Accessed 3/2014). 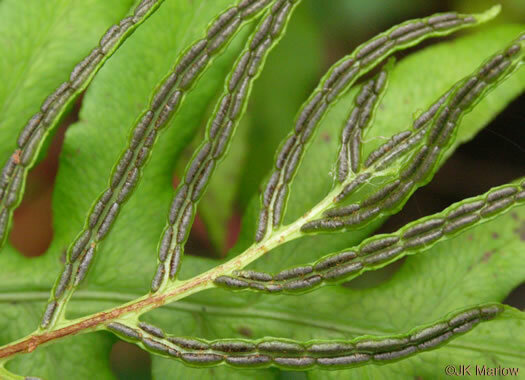 Woodwardia areolata is a fern from a creeping rhizome about 0.3 cm thick. Leaves arising singly; 30-80 cm long, stalk pale, about as long as blade (much like sensitive fern but smaller); blade 10-17 cm wide, deeply pinnately lobed, nearly pinnately compound near base, coarse, segments 7-10 per side, 1-2 cm wide, glossy, margins very finely toothed, somewhat thickened; fertile leaves longer than sterile, with narrow-linear, thickened segments, stalk shiny, blackish. 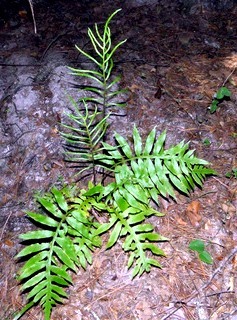 Woodwardia aereolata. spore cases .© JK Marlow. Oct., NC. namethatplant.net (Accessed 4/2017). Spore cases on separate fronds (sporophylls) oblong, 0.4-0.8 cm long, lined up end-to-end along each side of central vein, June-Aug.
Habitat: Swamp forests and wet woods, acid soil, shade tolerant, sometimes in slightly brackish areas (Cobb 1968).